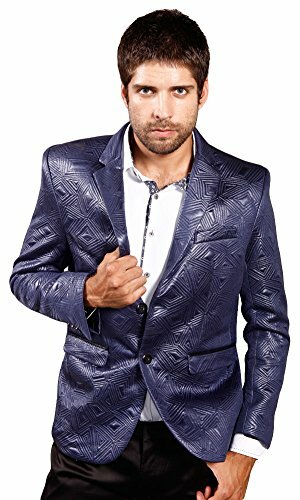 This Barabas Long Sleeve, Regular Fit Men's Blazer styled Jacket has a seemingly classic form mixed in with a modern design. This blazer includes everything that you would find in a traditional two button blazer, such as a clean lapel, pocket flaps, and a bit of trim. It also has a modern twist on it as well. It is made with a shiny material throughout to give it a unique pop as well as an embossed lined design that gives the appearance of angles through and through.